Of course, that’s not what he said at all. Why would he? Dr. Paul is both an American and a Christian. And Huckabee is a snake oil salesman, using his position as a minister to try and sell his image as a good political leader. Sorry. We need principled leadership more than we need moral leadership. Is Huckabee The Duke or The Dauphin? Which ever one he is, George W. Bush must be the other. Stay with me for a minute. I caught the end of a pretty bad film version of “The Adventures of Huckleberry Finn” on TV the other day, and I couldn’t help but be reminded of the Huckster Mike Huckabee when watching the con men Duke and Dauphin. I never thought I’d use the syllable “huck” so many times in one sentence. There was an important part of the book that was left out of the movie. Remember when the townspeople are so embarrassed that they were suckered by the “Royal Nonesuch” that they tell all of their friends how great it is, resulting in a bigger crowd the next night? Doesn’t that remind you of what’s going on right now? GWB is like the first night’s performance, and Huckabee’s encore would just be more of the same. Unfortunately, it seems like the Republican Party is starting to line up behind “more of the same” in order to save face for voting in the Royal Nonesuch we have right now. Still, I can’t help but be encouraged by how the novel turns out. In the end, The Duke and The Dauphin are tarred and feathered, and Huckleberry Finn has an epiphany (“all right, then, I’ll go to hell”) , which ultimately results in his and Jim’s salvation. Hopefully we’re living in a country full of Huck Finns and not Huckabees. December 16 sounds like a good day for an epiphany to me. Mike Huckabee has just completed his new stable of Four Horsemen.Â He’s now being endorsed by 16 time World Heavyweight Champion Ric Flair–WOOOO! This endorsement by the Nature Boy is enough to complete my heel turn on Huckabee.Â Flair has been added to the stable, headed up by Huckabee, which also includes noted jobbers Ted Nugent and Chuck Norris. 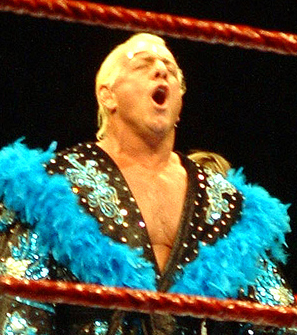 It makes sense to go out and recruit a proven winner like Flair to your side, but Nugent and Norris have never won anything…not even a tag team title or Intercontinental Championship. Huckabee also has a new campaign slogan–If you want to be the man, you’ve got to beat the man. Mitt Romney–Don’t hate me because I’m beautiful, I’m also a Mormon. John McCain–Vote McCain! Did I read the queue card right? Tommy Thompson–Wait ’til Fred gets here–you haven’t heard the last of the Thompsons! Rudy Giuliani–You know I was Mayor of New York during 9-11, right? Tom Tancredo–Â¿Que? Â¿No habla? Adios. Mike Huckabee–Even more likable than the last guy from Arkansas! Jim Gilmore–Hey, d’ya hear the one about Rudy McRomney? Ron Paul–I’ve actually read the Constitution, have you? Newt Gingrich–Ask my mom what I think of Hillary.